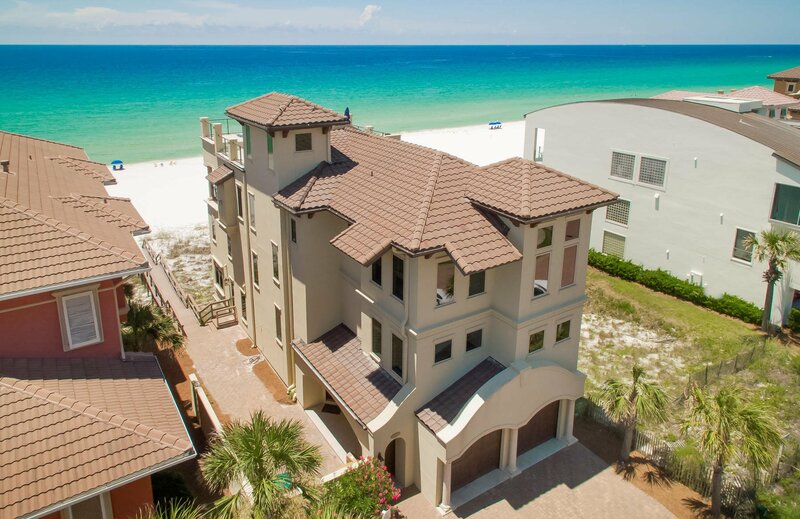 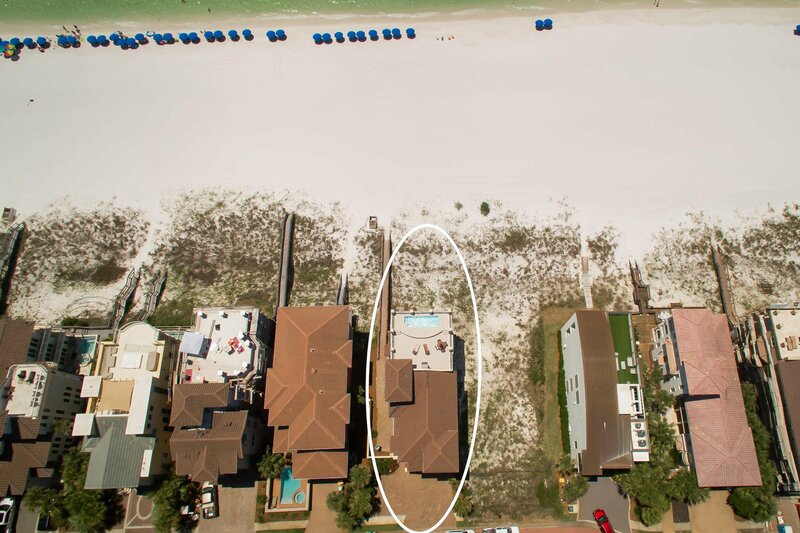 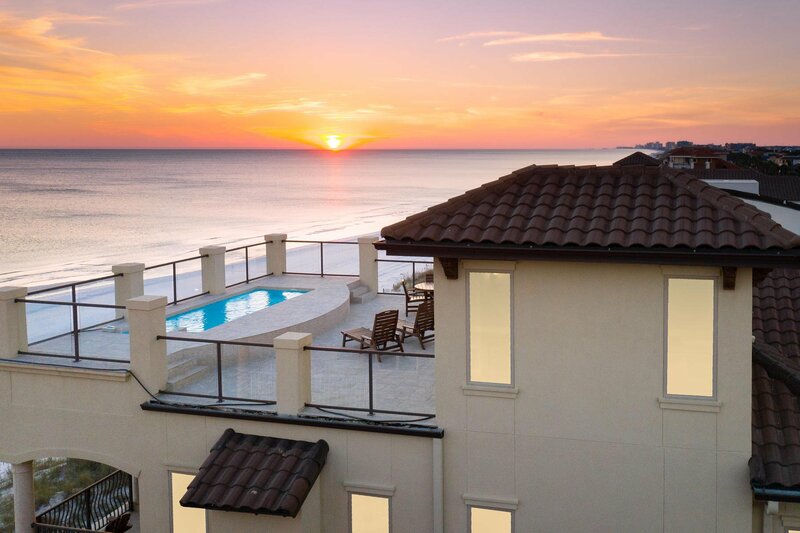 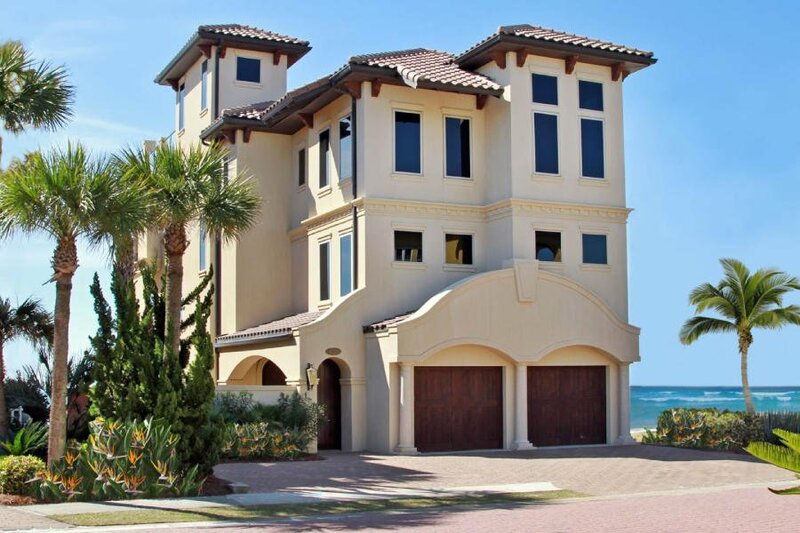 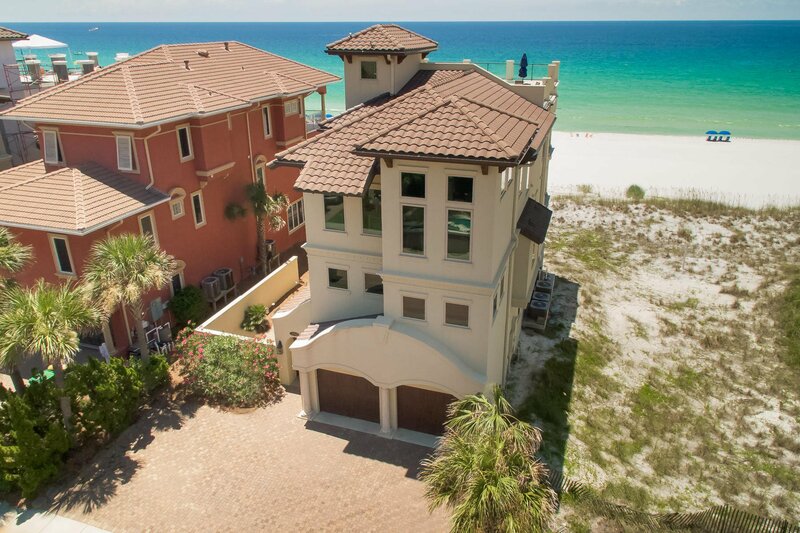 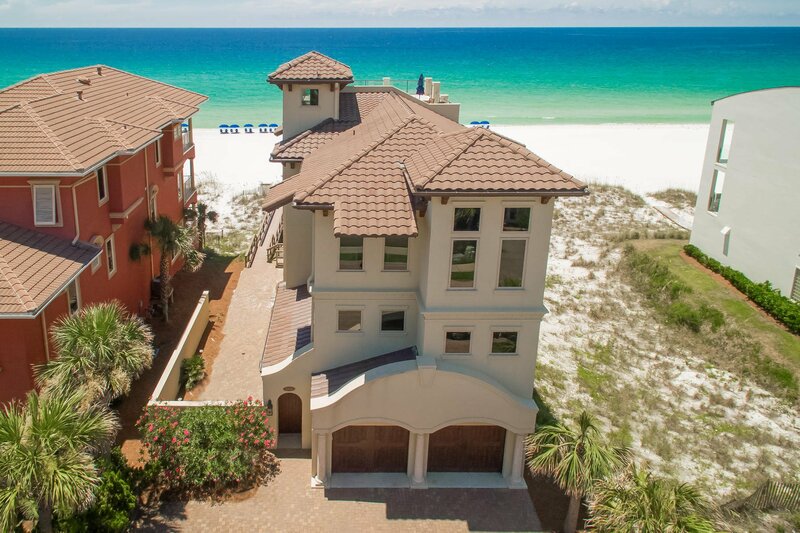 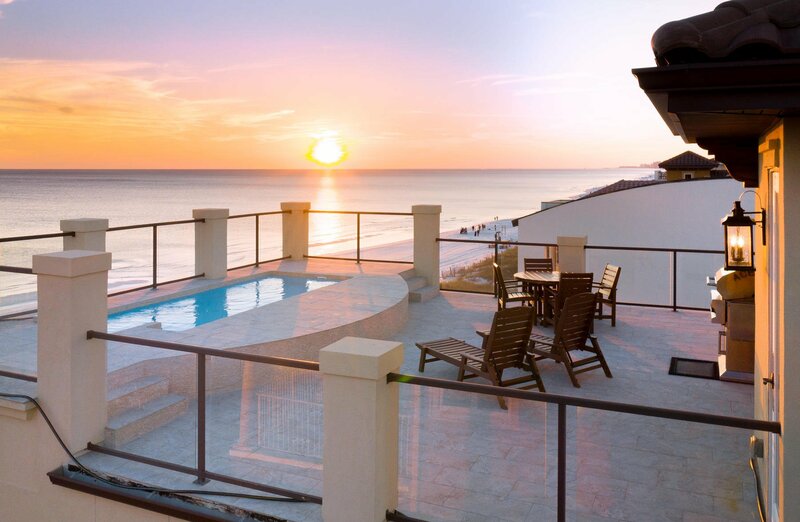 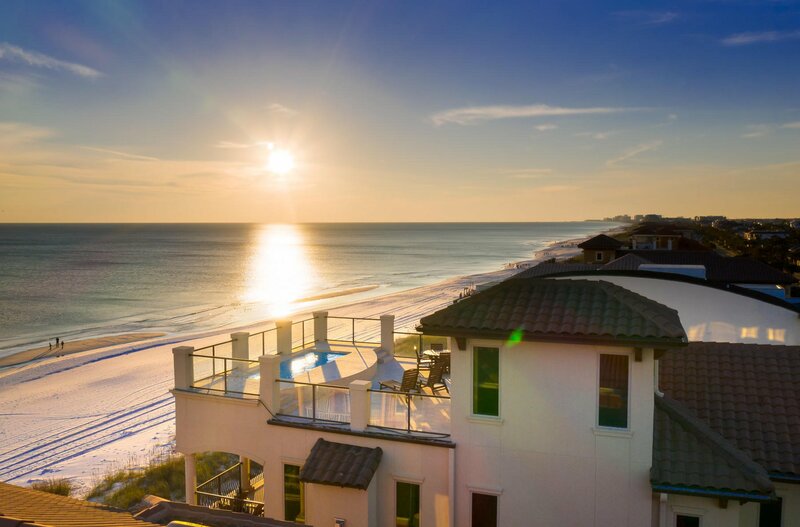 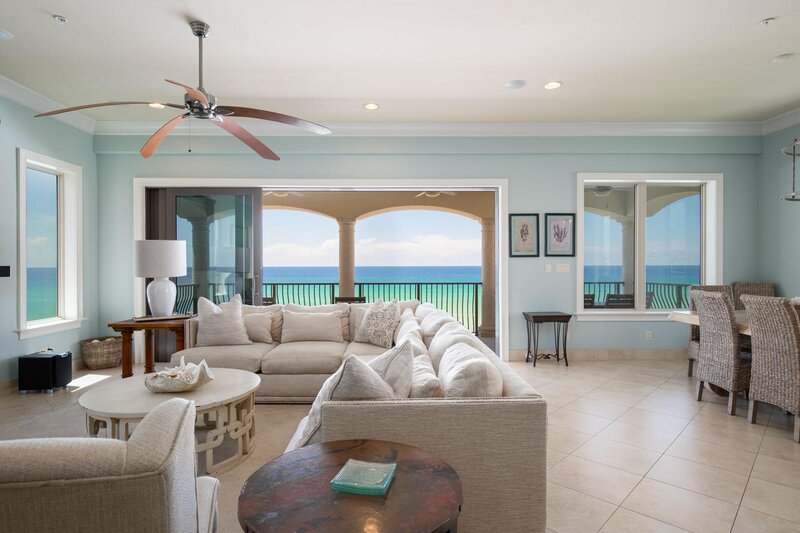 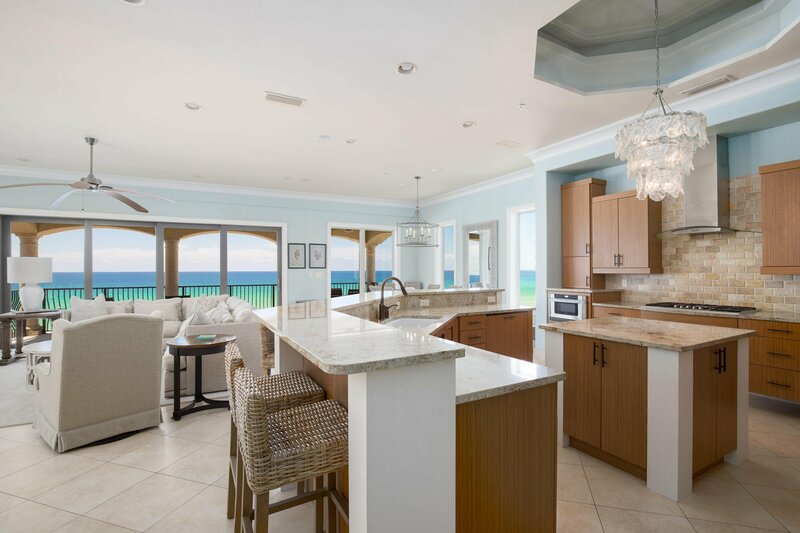 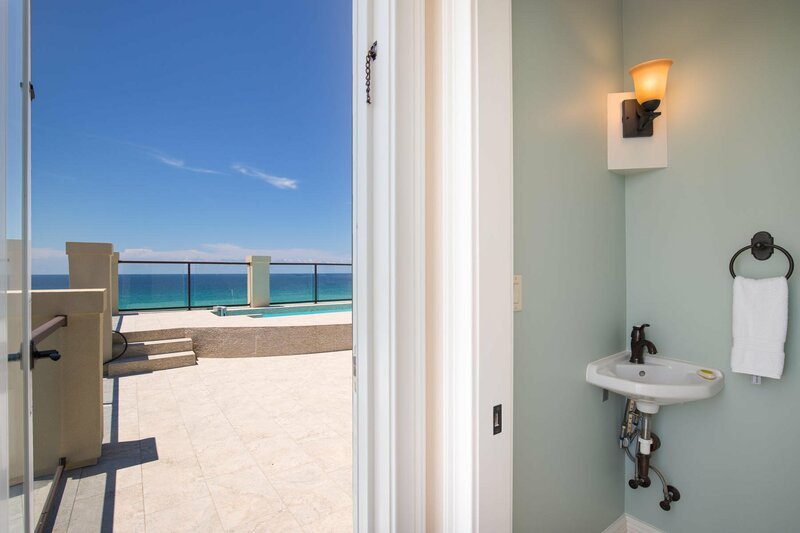 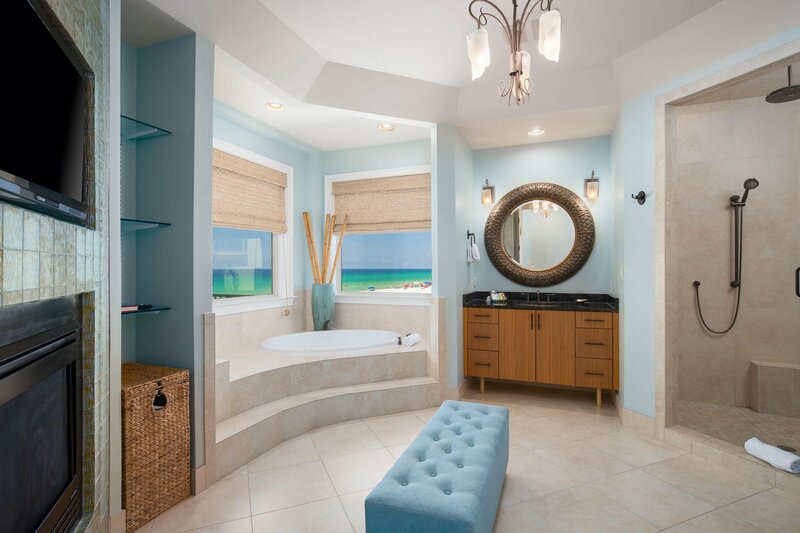 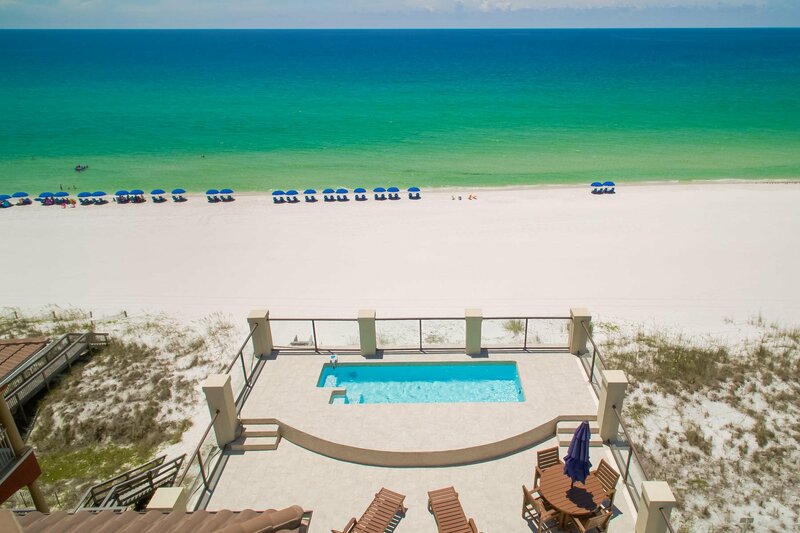 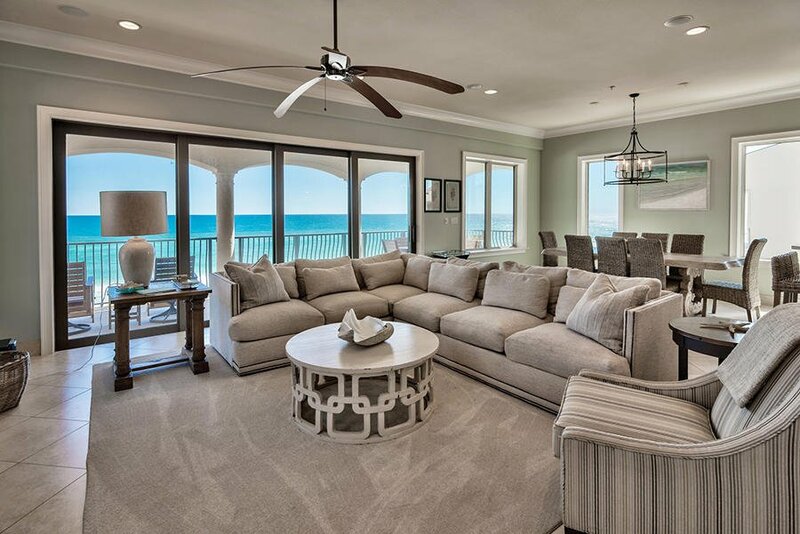 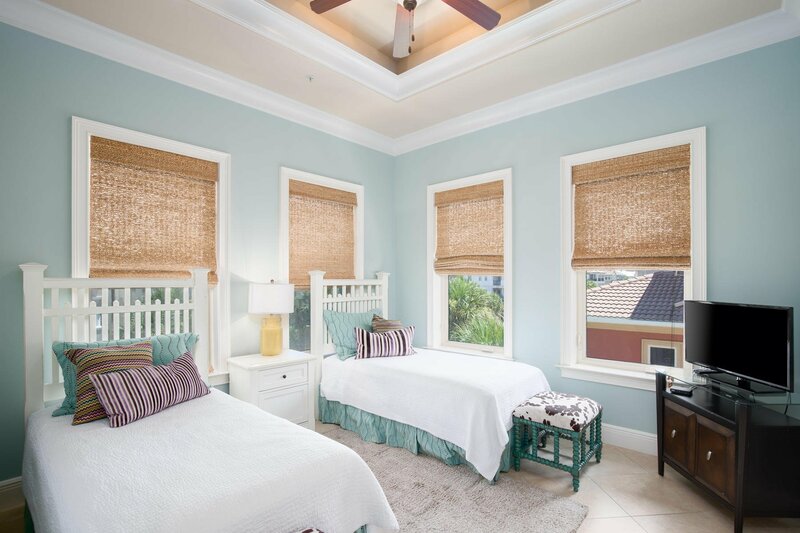 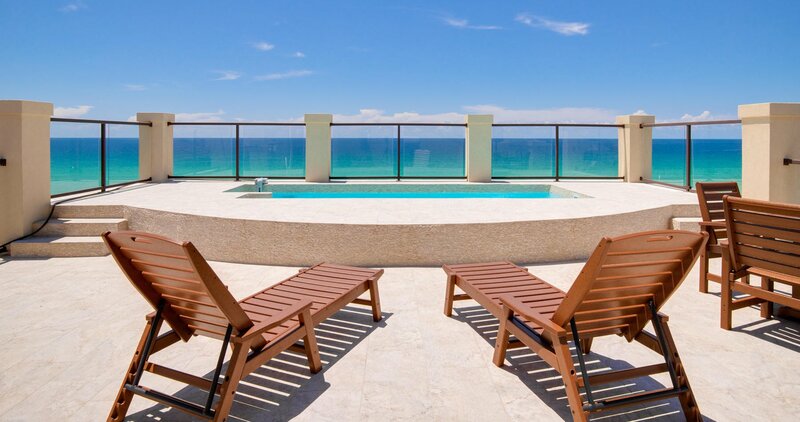 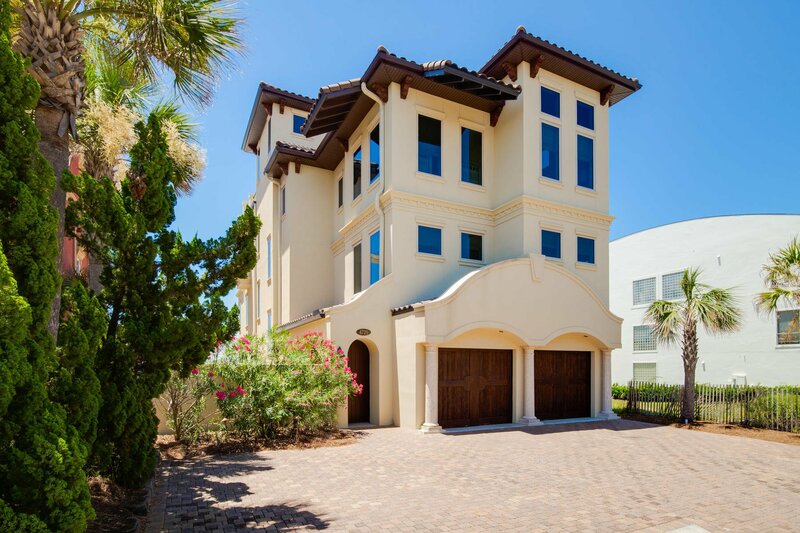 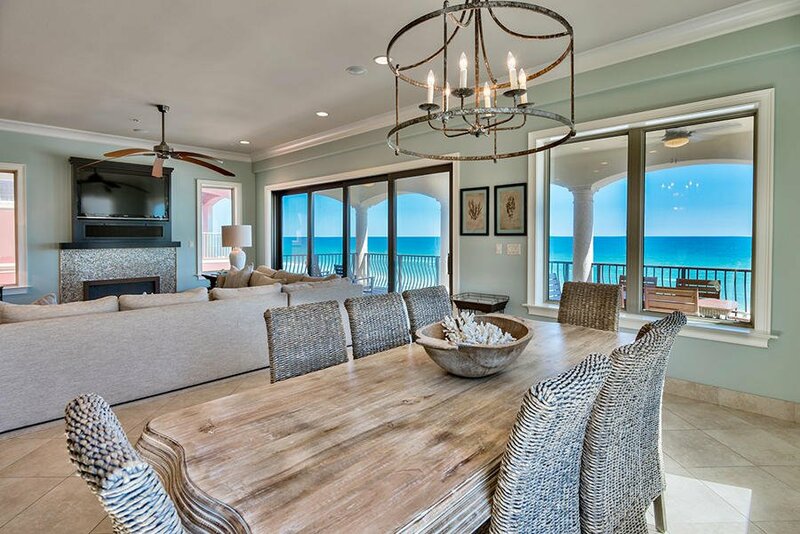 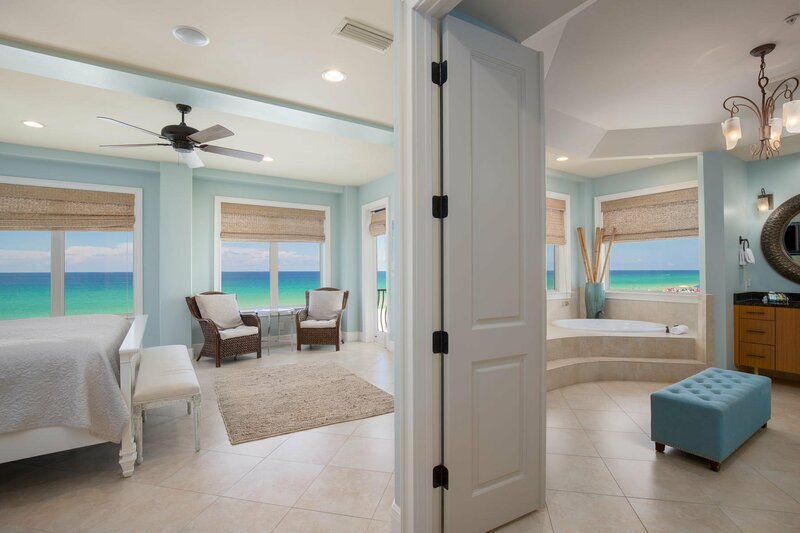 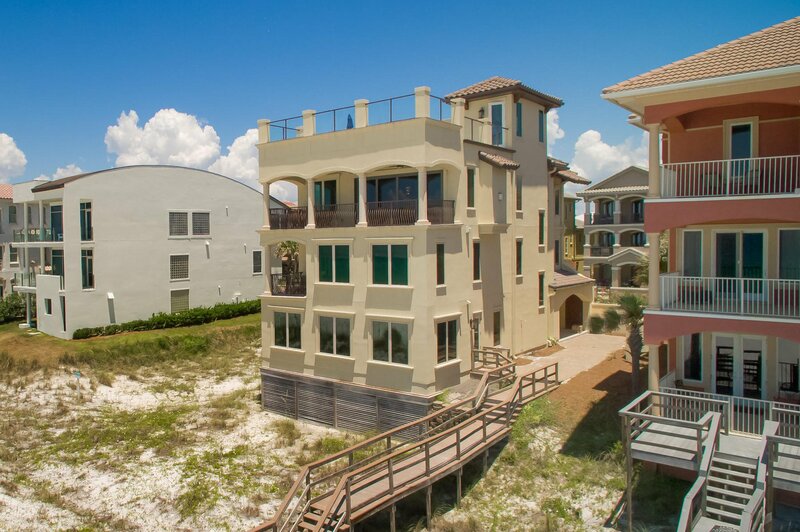 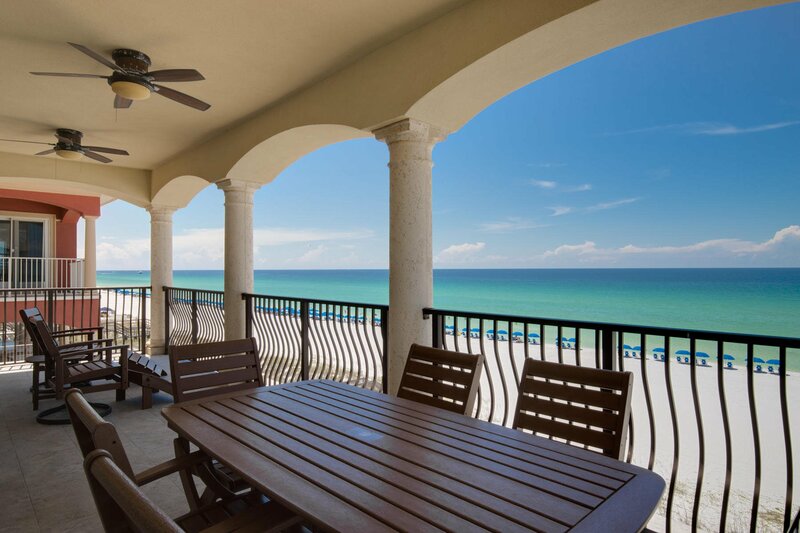 Enjoy captivating gulf views from all four floors of this impressive 5,567 square foot beachfront retreat spanning an impressive three stories primarily located behind the gates of Destiny by the Sea. 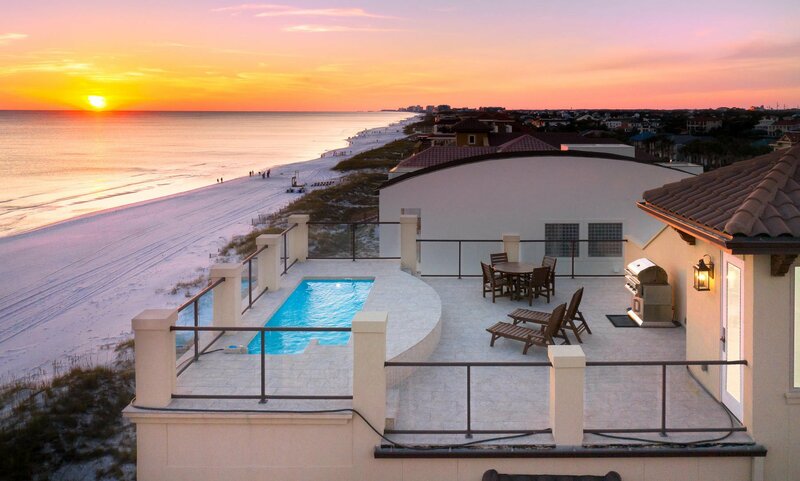 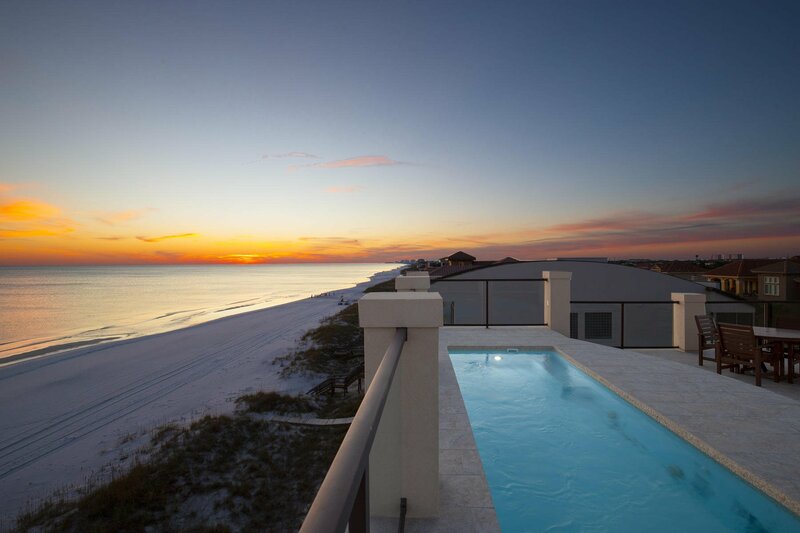 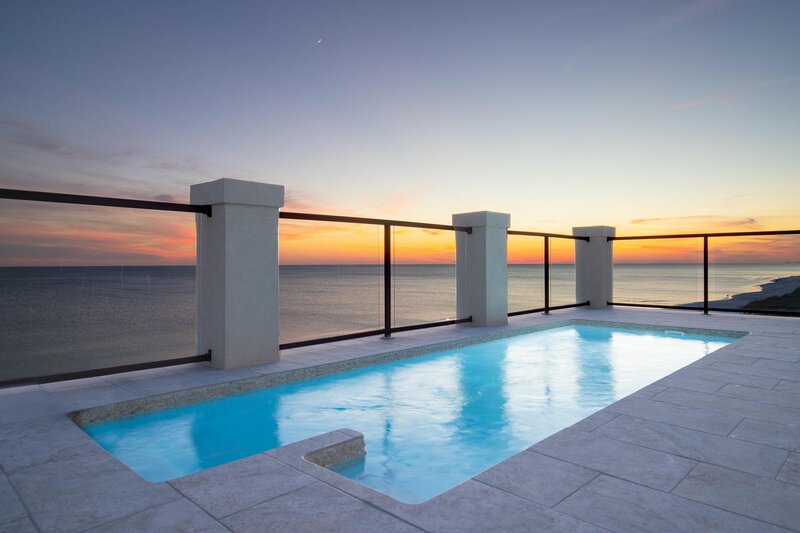 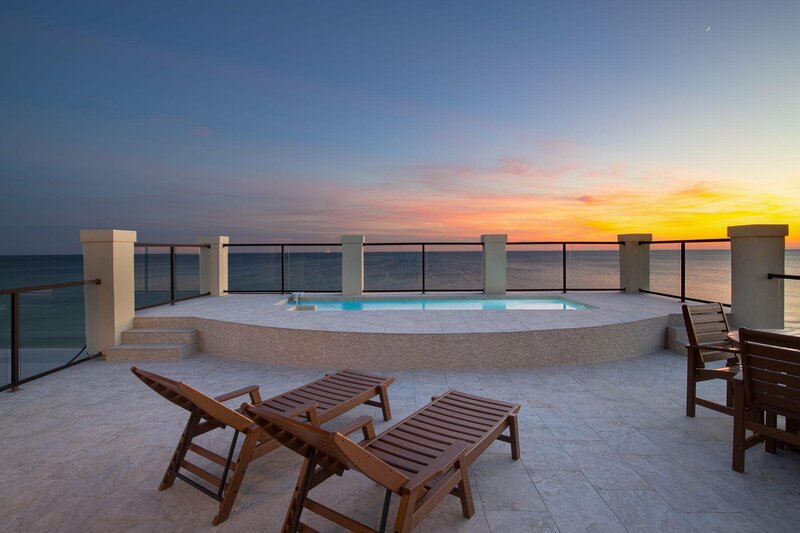 This expansive Mediterranean home boasts luxurious features including an extraordinary rooftop pool and private sun deck perfectly framed with contemporary glass railing offering panoramic views of the Gulf of Mexico, Choctawhatchee Bay and Destin cityscape. 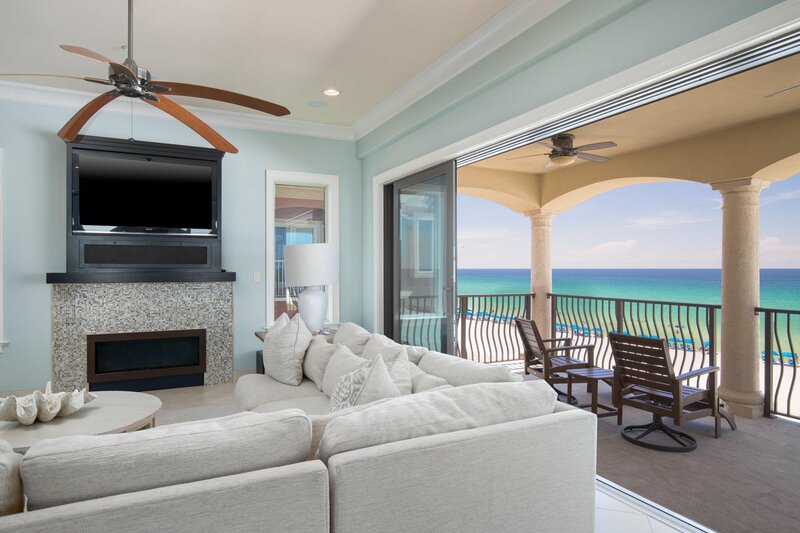 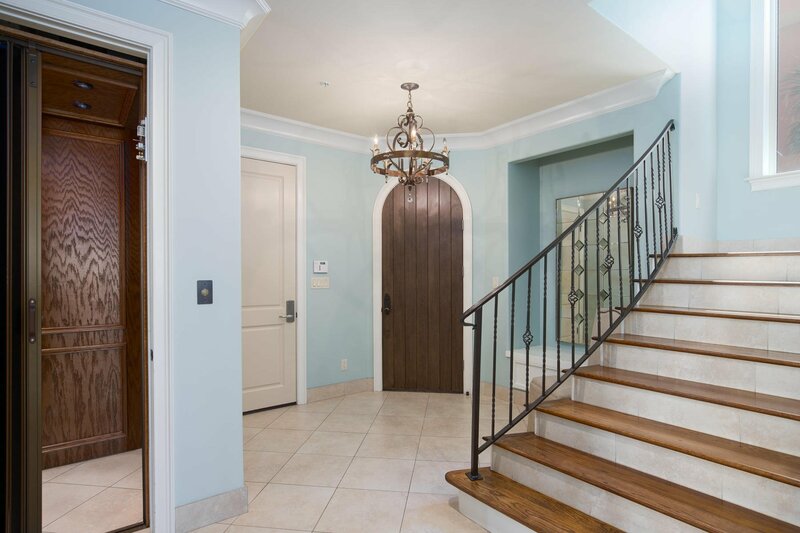 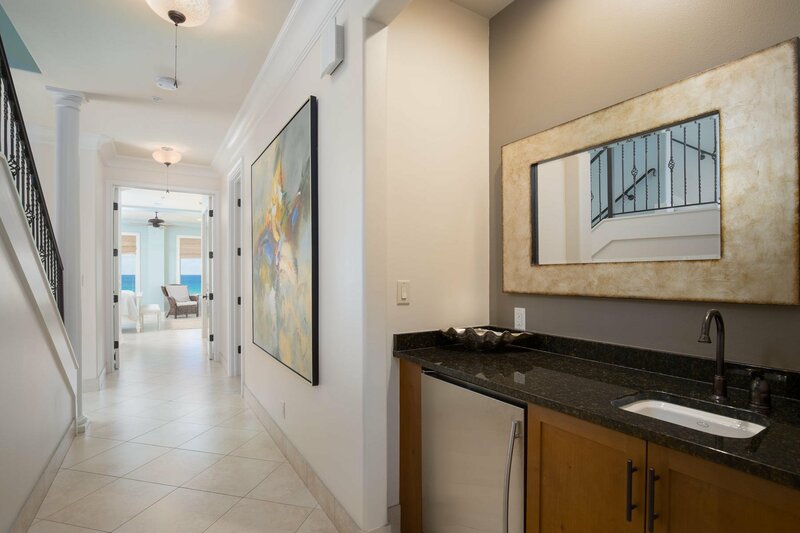 Other notable features include a private elevator, gulf front covered patio on each level with beautiful water views, a private courtyard with room for a potential second pool area, private beach access and spacious media room. 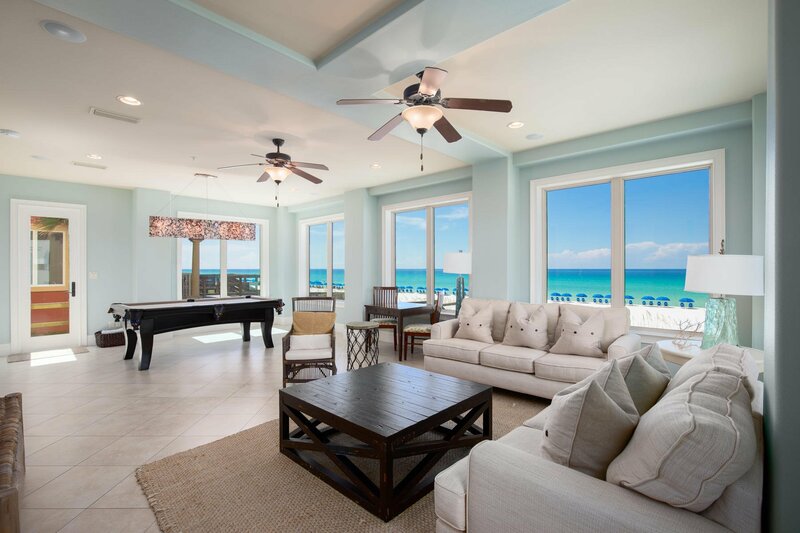 This well-designed open concept layout offers seven bedroom suites each with uncompromising privacy well-positioned to enjoy gulf vistas. 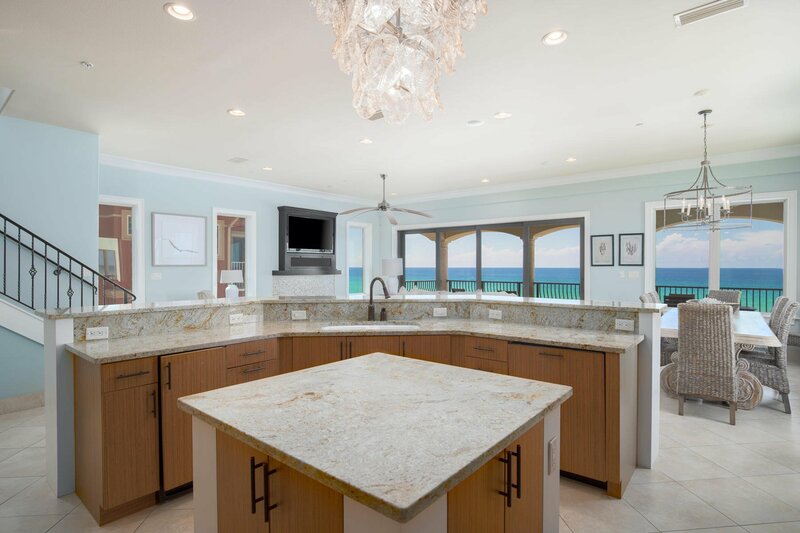 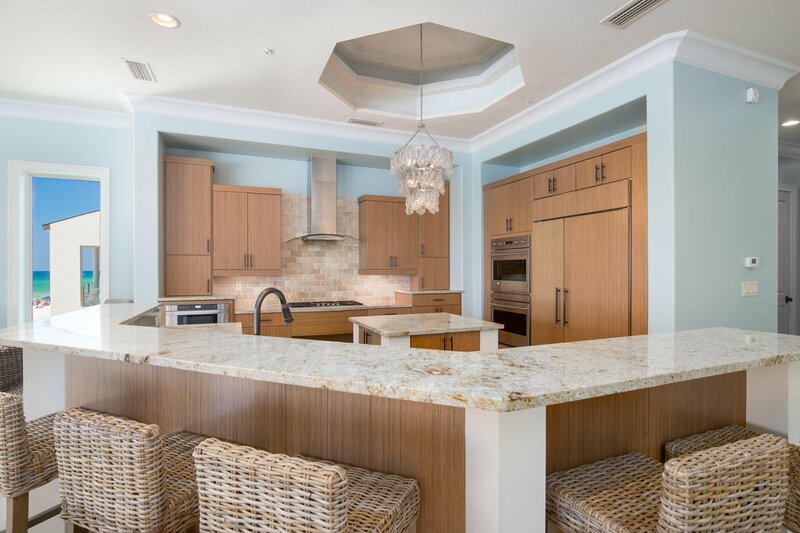 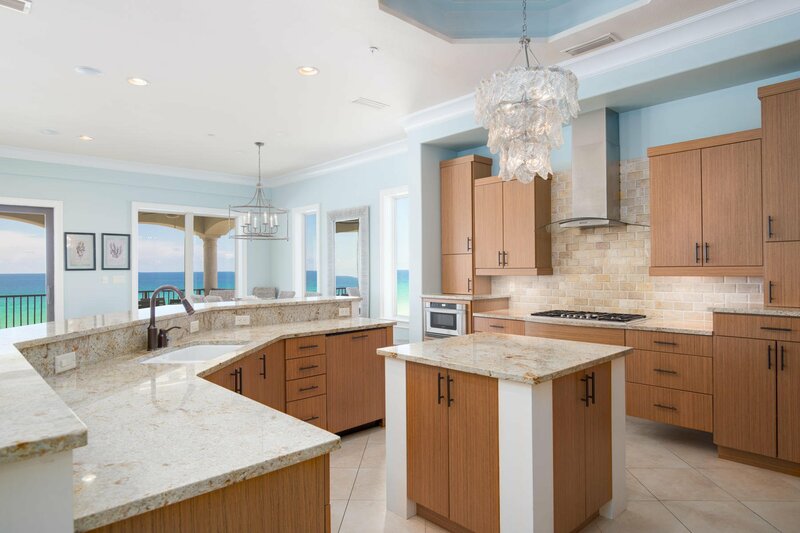 The second level gourmet kitchen is outfitted with double ovens and a gas cooktop all of which is open to the expansive living room framed by floor to ceiling glass windows that amplify the endless water views. 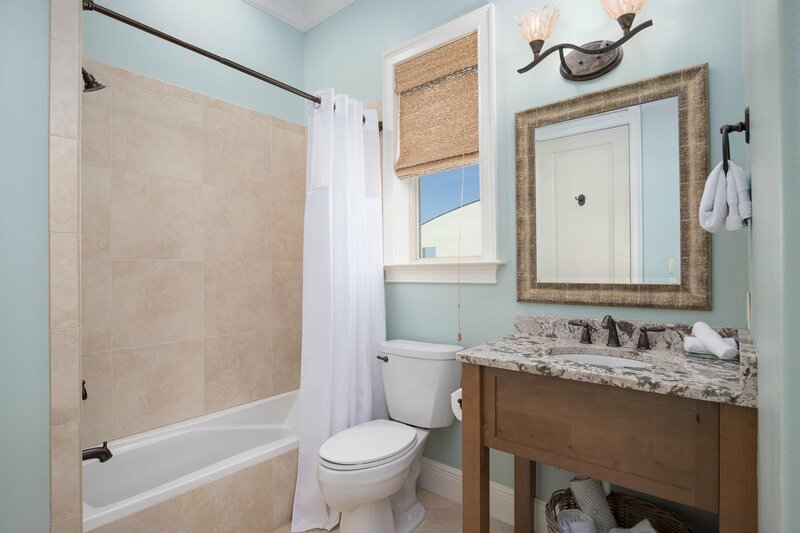 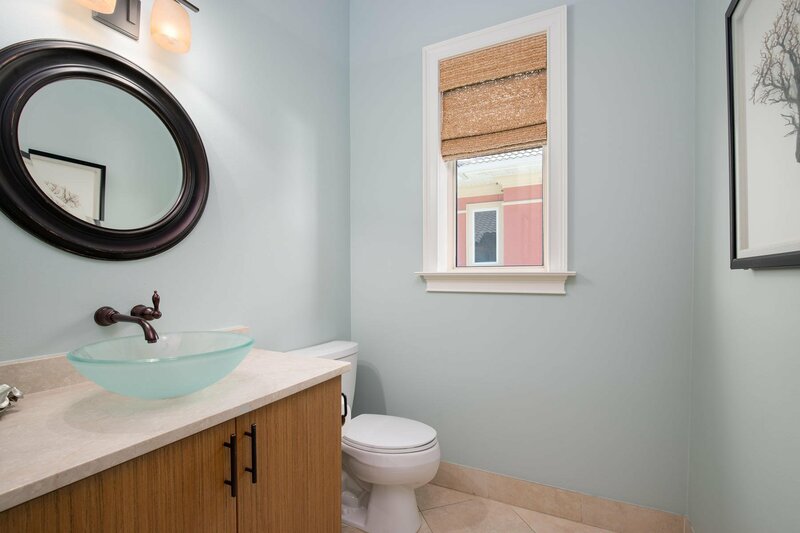 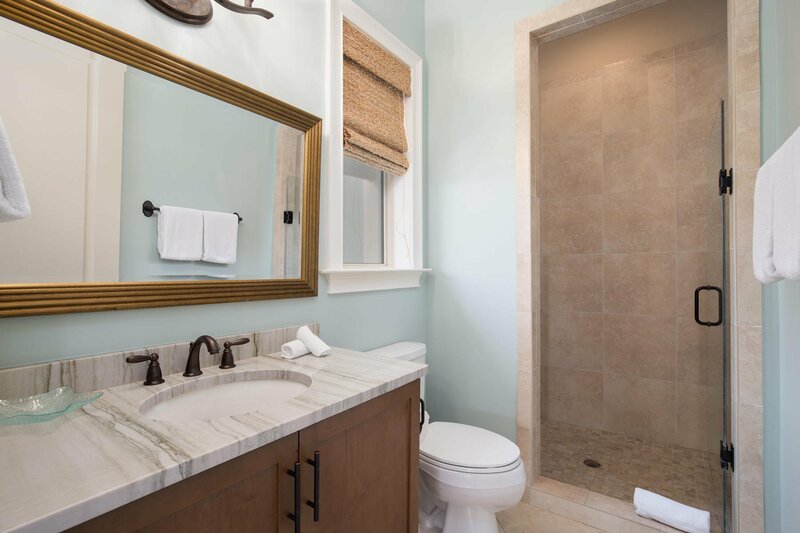 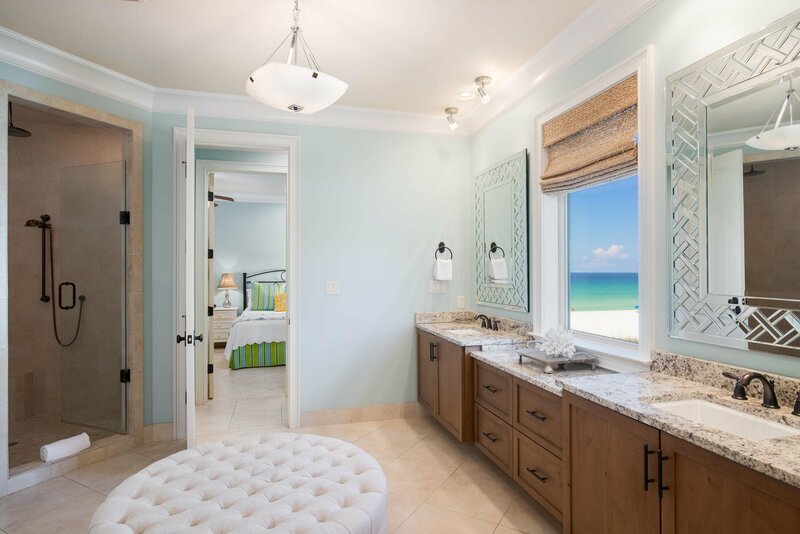 The second level also features two premium master suites complete with spa-like en-suites outfitted with double vanities, a large soaking tub, fireplace, walk-in closets and a wet bar. 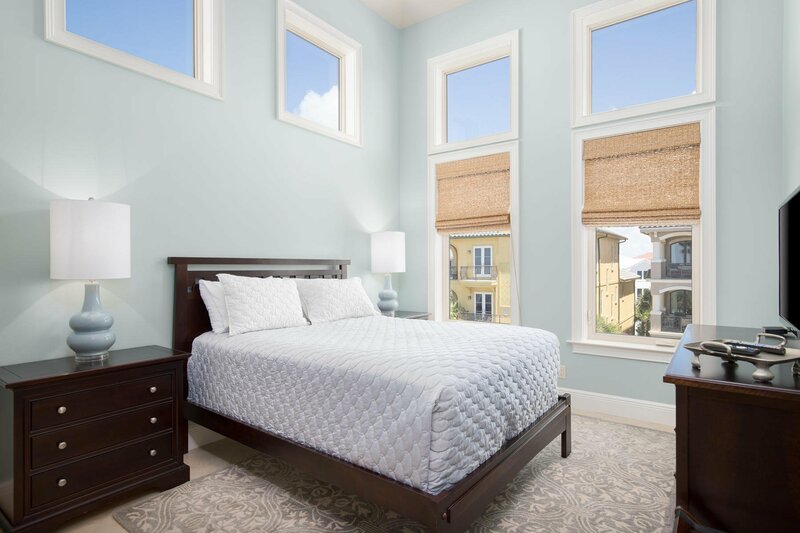 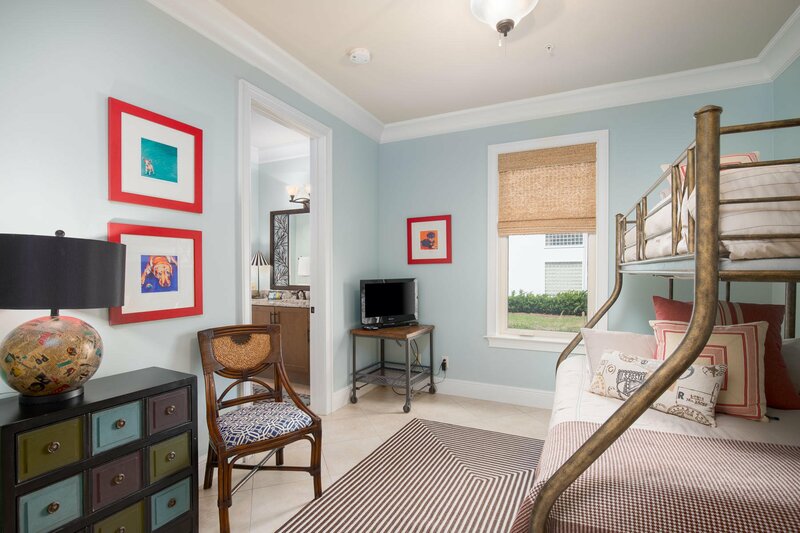 Exceptional rental potential abounds with sleeping capacity for up to 20 guests comfortably with ample parking including a two-car garage. 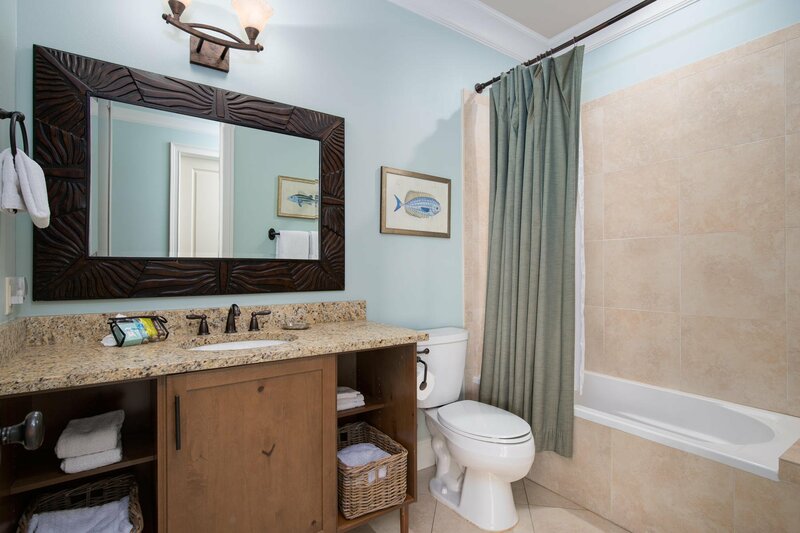 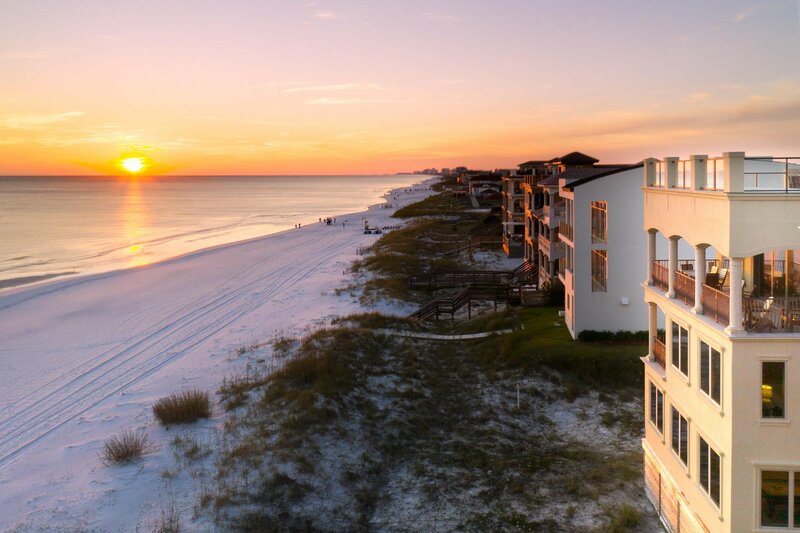 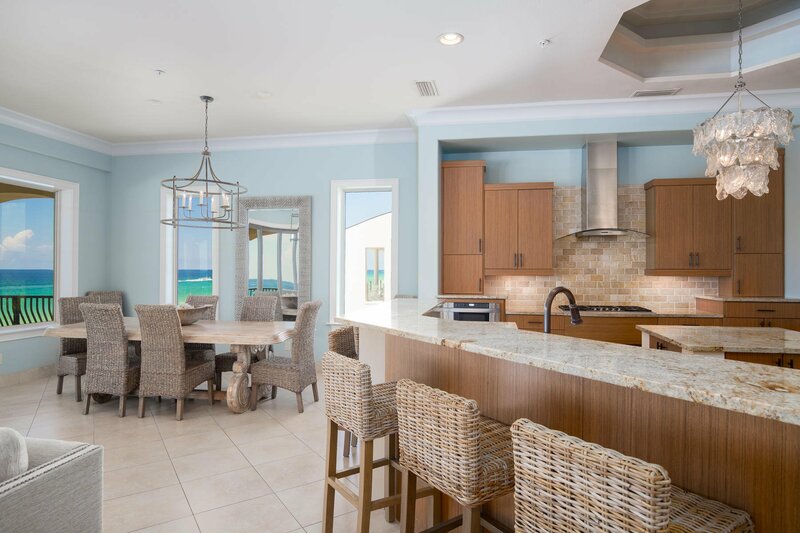 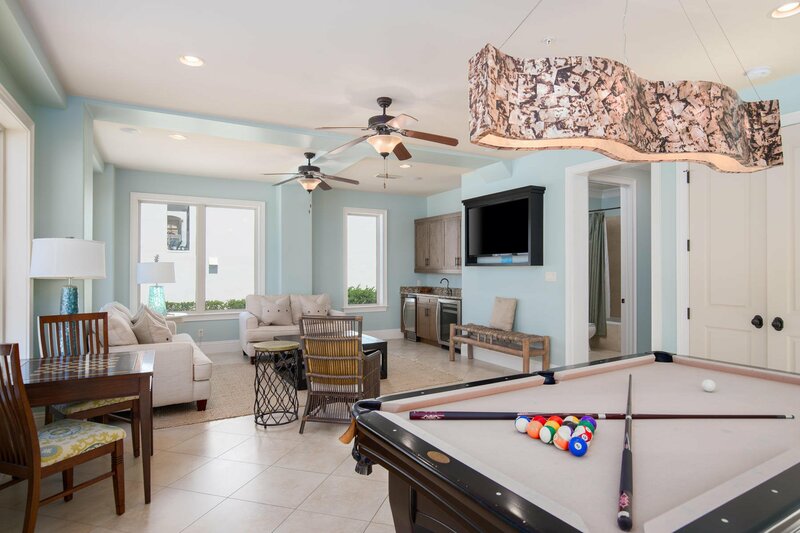 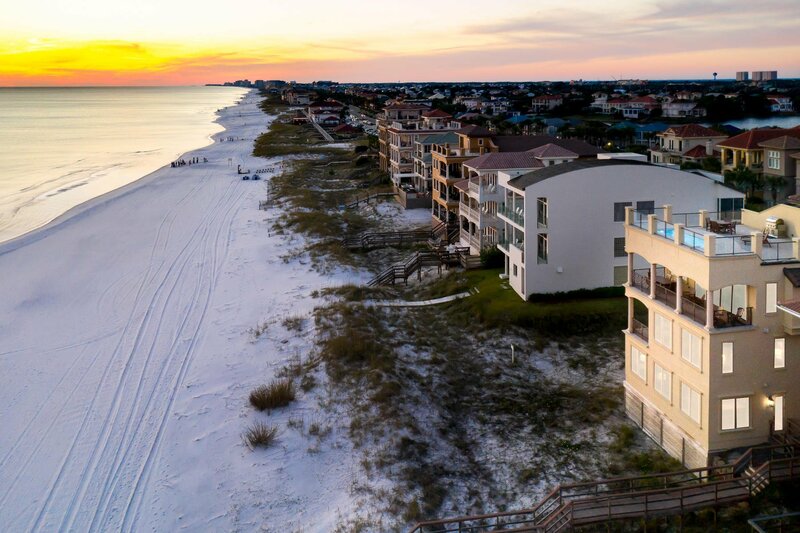 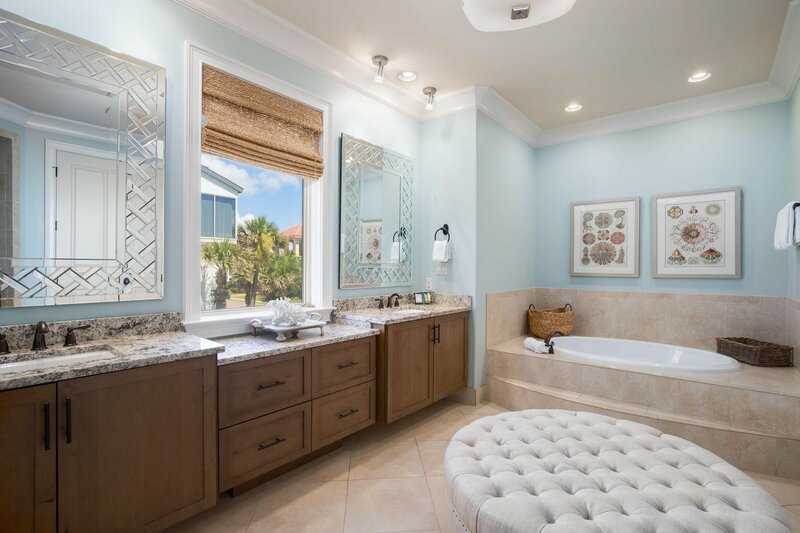 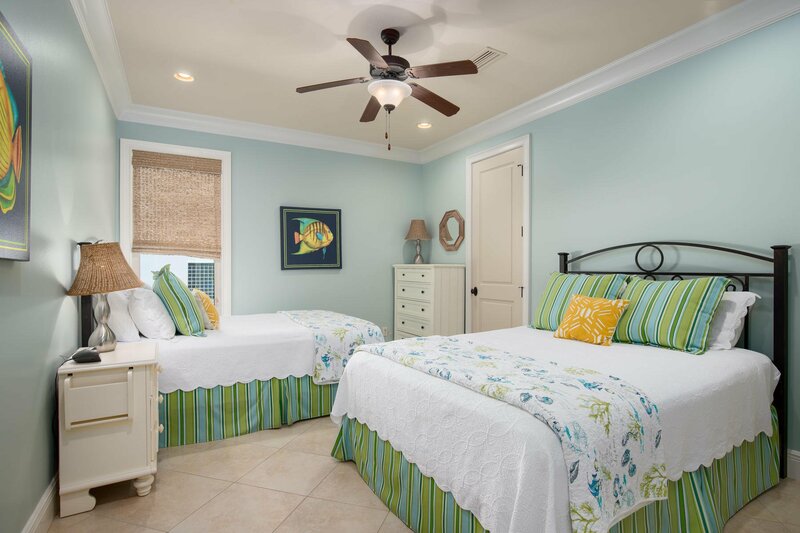 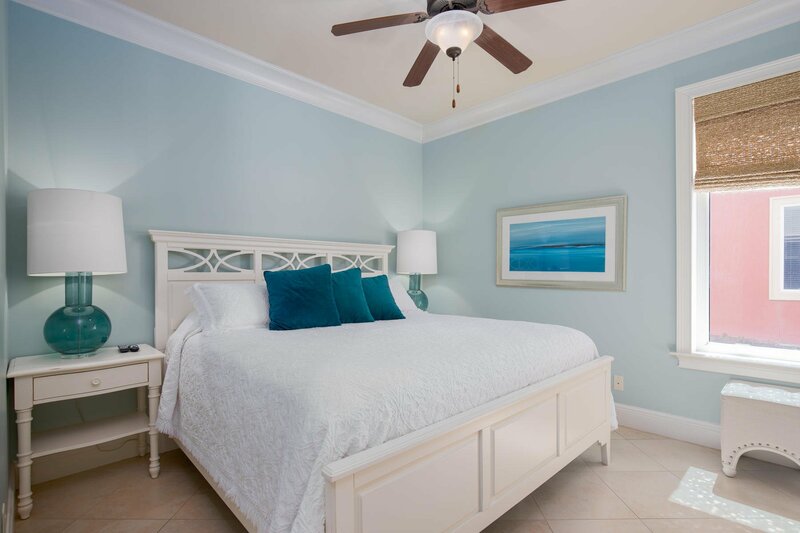 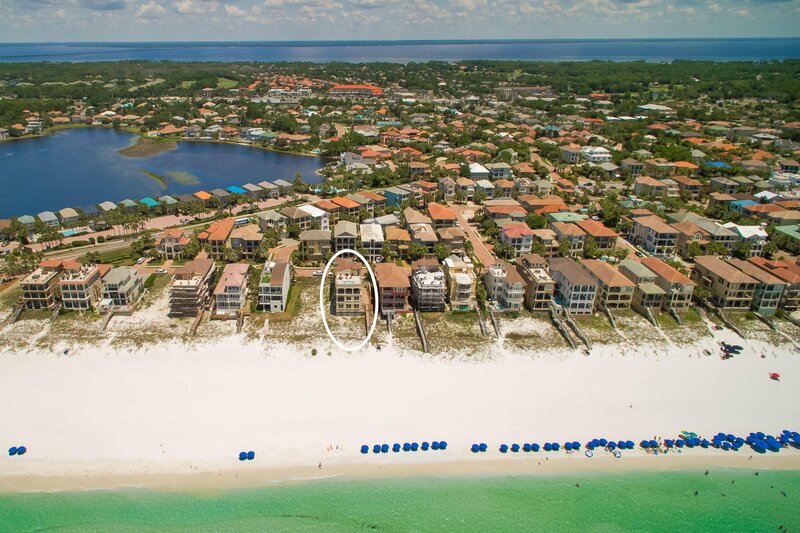 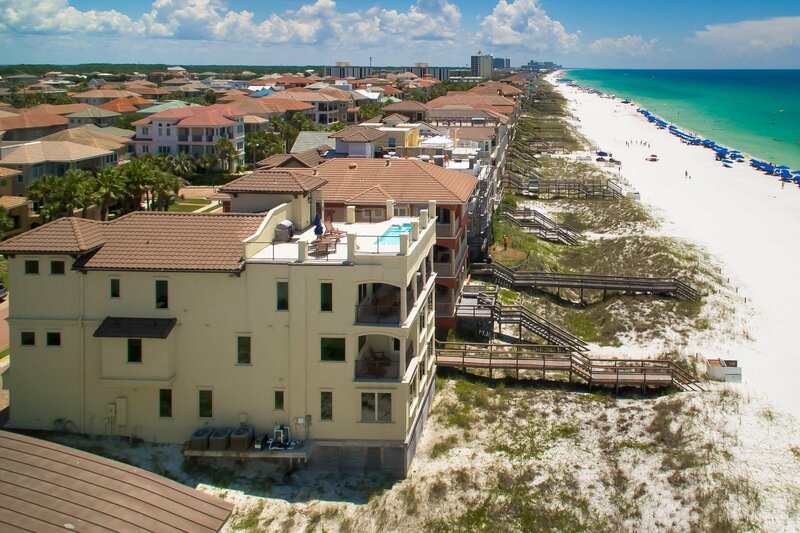 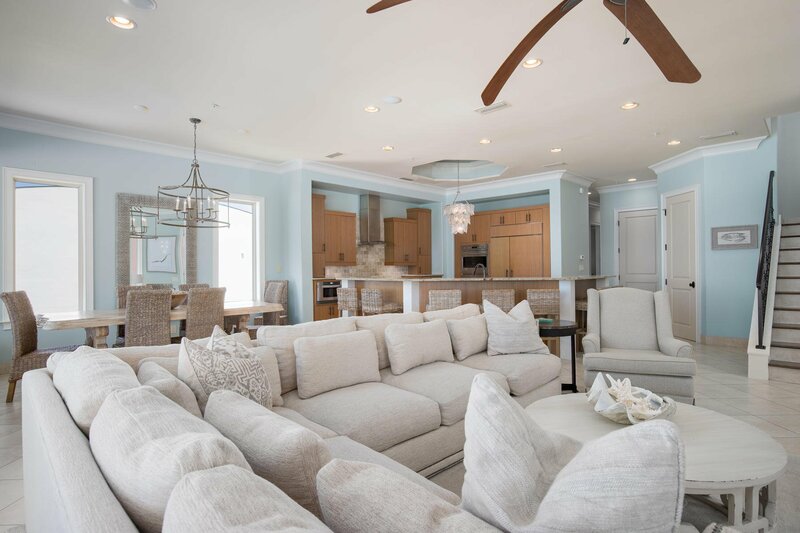 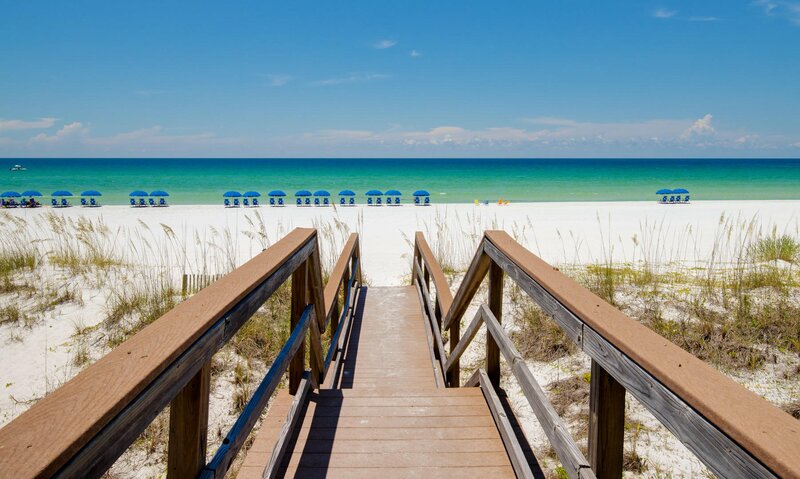 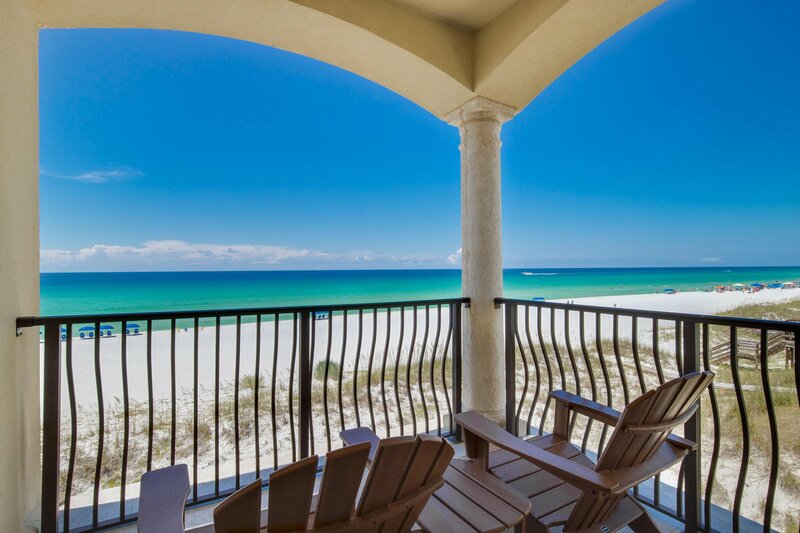 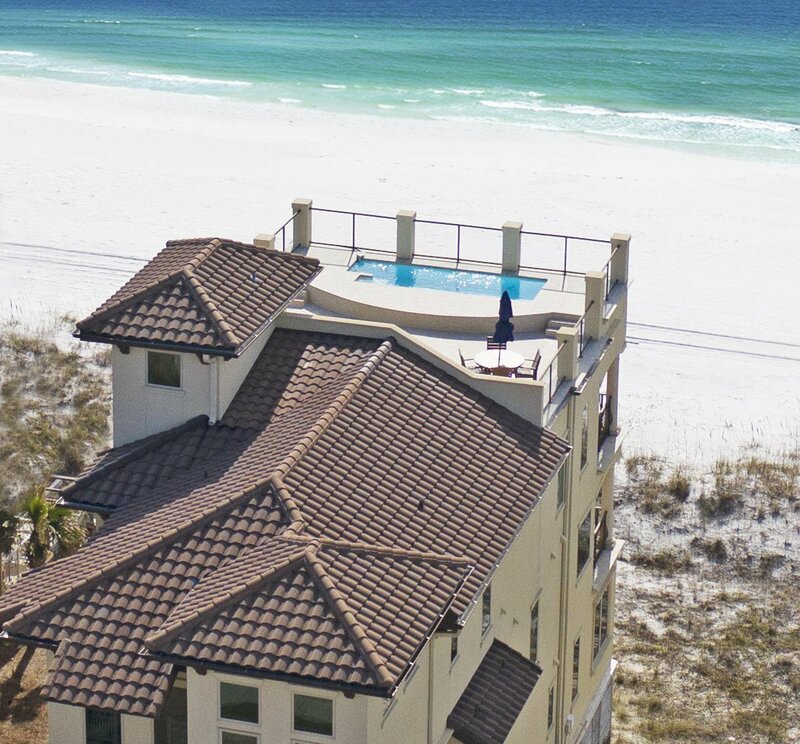 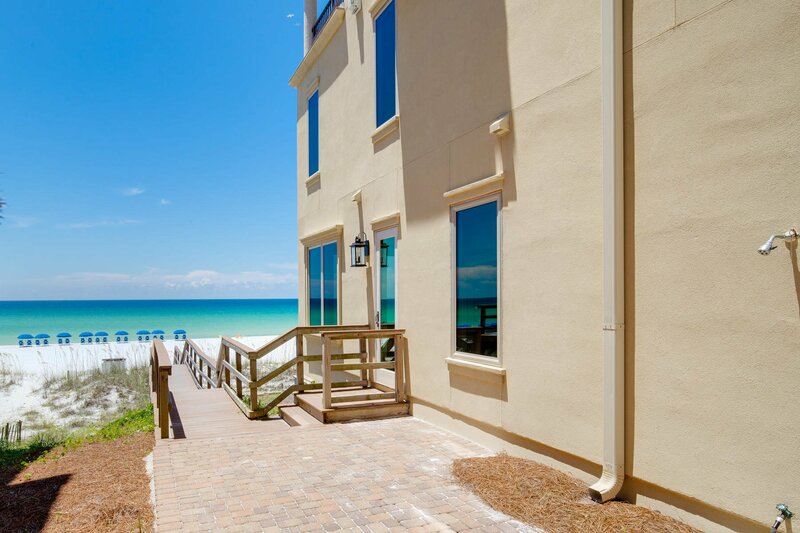 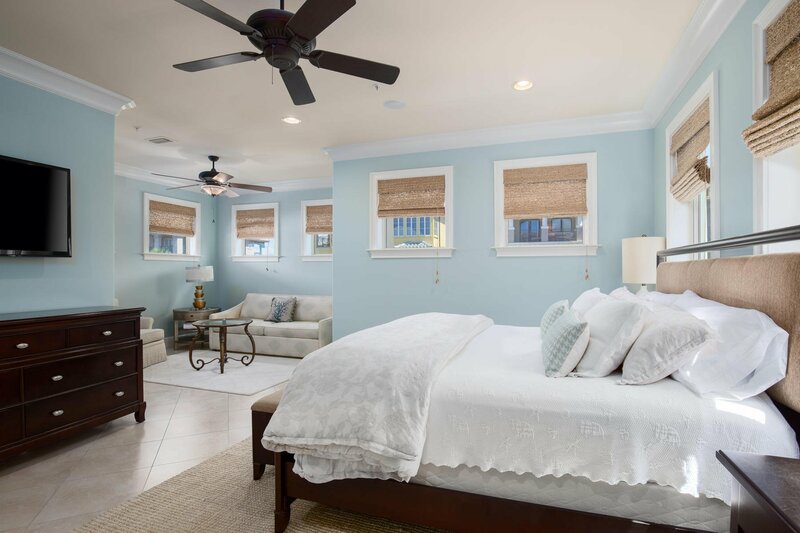 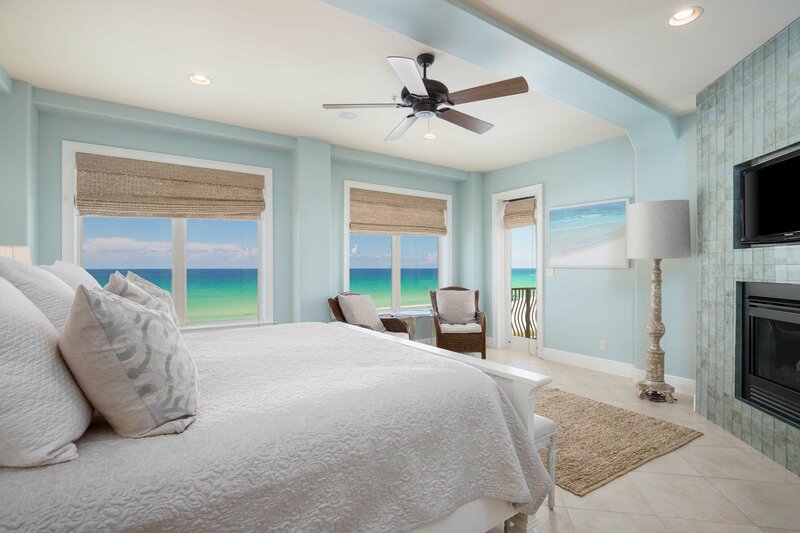 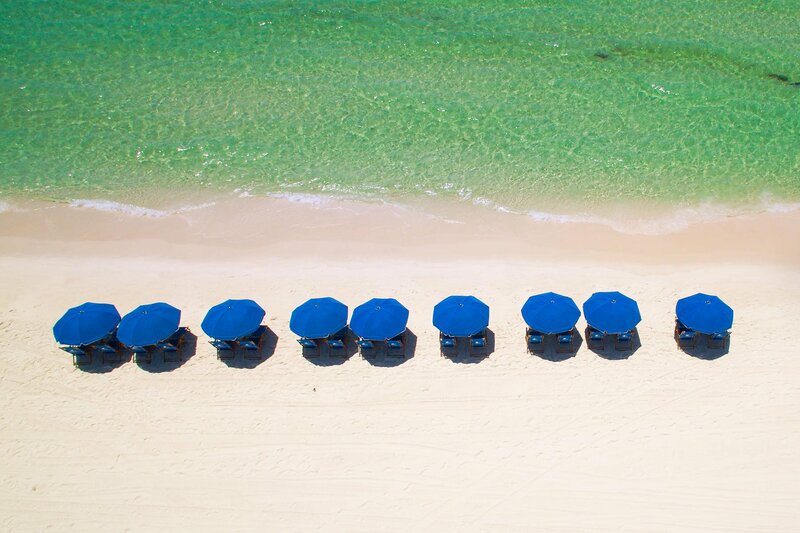 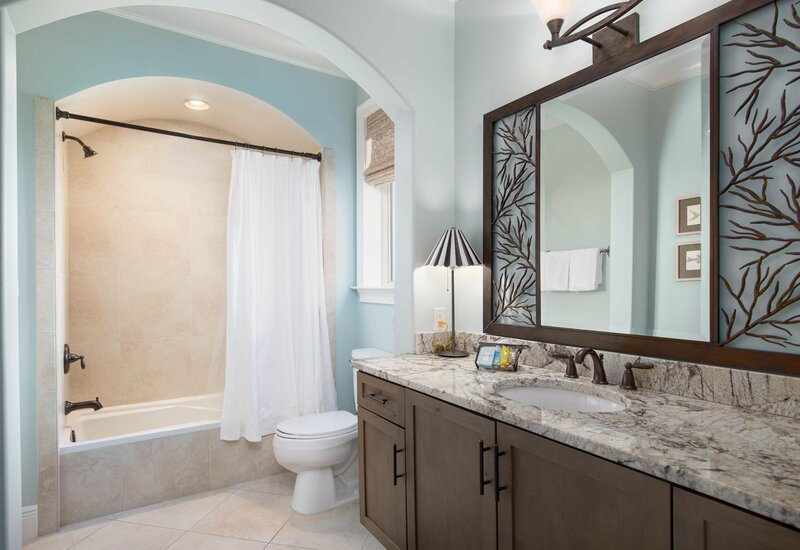 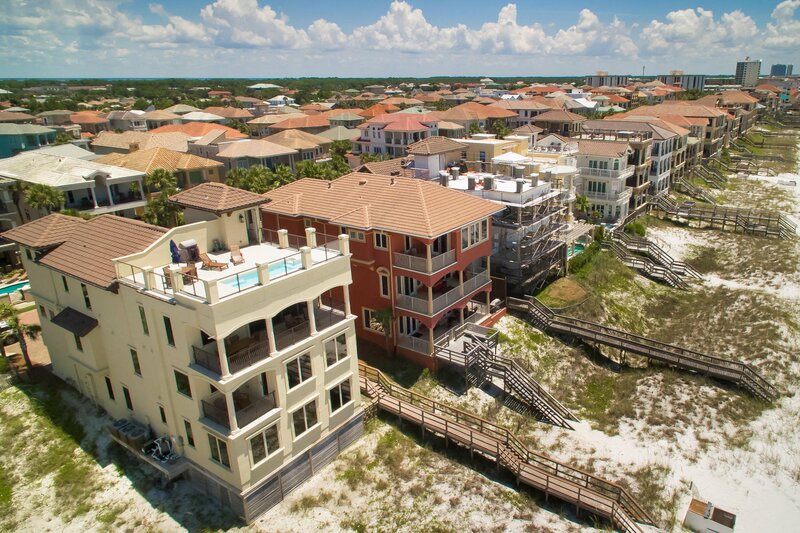 Located in the community of Destiny by the Sea, residents have access to the 3,000' of pristine private beaches, a resort style community pool and primarily located near all of the shopping, dining and entertainment of Destin Commons.